Warning: Huge spoilers for “Interstellar” follow. Director Christopher Nolan’s films are known for being shroud in secrecy. You usually know very little about the plot even after the first trailers are revealed and sometimes a few big names pop up in unexpected roles. 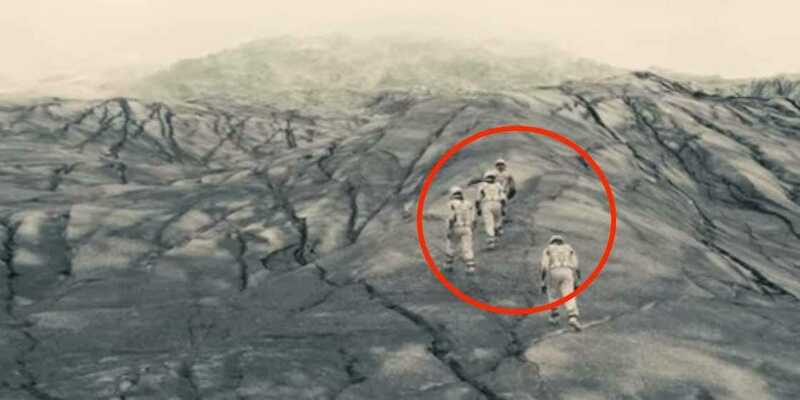 In fact, he’s been hiding in the “Interstellar” trailers and no one has even realised it. Around the two hour mark in “Interstellar,” Matthew McConaughey and Anne Hathaway’s characters, in search of a habitable planet to save mankind, land on a foreign planet covered in ice where another astronaut, Dr. Mann, has been stranded for an undetermined amount of time. Up until this point, viewers know little about the mysterious Dr. Mann other than he’s a supposedly brave astronaut who set off on a similar mission in the past. When Cooper and Brand come across Mann, he’s sealed in a cryogenic hibernation pod. As they awaken him, you have a feeling it’s about to be a huge actor reveal. Sitting up, staring us straight in the face is Matt Damon. This won’t be a surprise to everyone. The Playlist reported back in summer 2013 that Damon joined the cast in a small, secret role; however, no one really made a big deal out of it. Damon’s role is so secretive that he isn’t mentioned anywhere in Paramount’s lengthy production notes for the film handed out to press at screenings. In fact, he’s listed as an uncredited actor in the film. It’s surprising more people haven’t been discussing it online yet, because if you’ve steered clear of trailers and news, you’ll be genuinely shocked. It’s surely one thing people will be talking about after seeing the film. The best part? Damon’s been staring at us in the trailers. There are at least two instances of his character I’ve managed to spot after going back and re-watching the trailers. Here on the icy planet you can spot four astronauts. There’s McConaughey and Hathaway’s characters, along with another astronaut played by David Gyasi. If memory serves correct, Damon is in the lead as he shows off the planet to the others. In another more prominent scene that stands out in multiple trailers, you can see his figure as he reacts to an explosion. I won’t give too much more away about Damon’s role, but I will say there is a scene where Damon and McConaughey fight in their astronaut suits and for some reason all I could think was that two of People magazine’s former Sexiest Men Alive were having it out. It wasn’t too long ago that Matt Damon was one of the biggest stars in Hollywood, starring in everything from “Invictus” and “Informant!” to “True Grit.” Now, McConaughey has sort of taken that crown from him during an age that has been coined the McConnaissance, so to watch the two duel it out in a battle royale of sorts is kind of fitting. Of course, I’m sure this isn’t what Nolan intended. But now you’re going to think about it, too. I wouldn’t be surprised if we start to see more of Damon in marketing after the film’s nationwide release in theatres this Friday, Nov. 7.